Dinner is on the table in the time it takes to boil water and cook the pasta. Much faster than grabbing take-out, and the ingredients can be kept on hand for when you need a super fast meal. I altered this recipe from Country Gourmet Cookbook. That recipe called for raw eggs and I’m not willing to risk a case of food poisoning for dinner, so I took the eggs out and added a bit more cheese and half & half. Put the water on to boil and cook the fettucine according to the package directions. Warm the half & half in the microwave for 1-2 minutes. You don’t want to boil it, but you do want it warm. Drain the pasta and put it back into the cooking pot. Add the 4 Tbs. of butter to the pasta. Pour in the warm half & half and add the cheese. Season with salt and pepper to taste. You can also add finely chopped basil or parsley. I’m usually in too much of a hurry to fuss with that when I make this meal. For my family of 6, this is enough pasta if I serve a few side dishes with it, like salad, broccoli or bread. I really need to start making a double batch to keep everyone happy. The big kids really eat a lot of this! 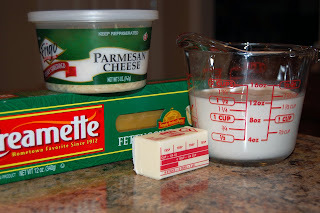 I have been looking for a good simple alfredo sauce and homemade. Thanks this is my dd’s favorite. 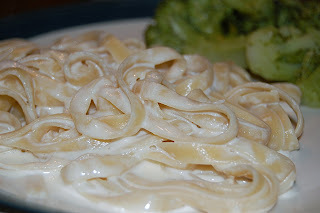 Thanks for posting this my son loves alfredo but I can’t find a simple recipe. This looks great. Thanks again. Yum! What a simple alfredo, I’m excited to try it. Yum! This might just appear on our dinner table this week! And the picture is REALLY good! This is much simpler than the one I use! I will have to try it! I LOVE alfredo! BTW, love what you did with the blog! Tiffany, you totally made my day with the blog award, thank you so much! SOUNDS YUMMY! I JUST RECENTLY (YESTERDAY!) COOKED 10 LBS. OF CHICKEN AHEAD AND FROZE TO BE USED IN MEALS–COULD POP A BAG OF THAT IN WITH THE NOODLES! I’M HUNGRY FOR DINNER, AND IT’S NOT EVEN 6:00 A.M.! THANKS FOR THE GREAT SHARE! this looks soooo good! Im gonna make this for my fiance as soon as I get the chance. This looks yummy! I read somewhere that you can use evaporated milk as a sub for heavy cream.. wonder if it would work here in place of half&half? Hey that’s what we’re having for dinner – well if you added in nutmeg. Agreed this is a simple and tasty meal but we always add sides, usually broccoli. @ Ryan Ashley Scott – I’ve used regular milk with a bit of extra milk powder, sour cream and all varieties of cream to make this and it has worked fine. We usually have broccoli with this too. It just goes together.